We are so pleased to introduce Charming Annie - a complete collection of 12 designs that would delight any little girl. Once the designs were completed, our Samantha announced that she wanted a real Annie Doll so we also have a companion project that makes a real rag doll just like Charming Annie. The companion project will make a doll approximatley 14" tall. It includes all the pattern pieces for the doll, for her dress and for her shoes. 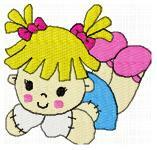 In addition, there is a pattern that will embroider the face for you as well as the flower on her dress!